My menu will be up later today, but don’t let that stop you from linking up. I’ll be updating my menu and everyone’s links through out the day. What will be served up at your house this week? What is on everyone’s menu this week? Heather of Celiac Family has an awesome list of inspiring cookbooks to check out. I am SOOOO excited to add everyone’s suggestions to my Christmas wish list! 🙂 Yum! This week she is Chicken Tacos with Guacamole, Chinese-Style Braised Pork in the Slow Cooker from The 163 Best Paleo Slow Cooker Recipes with Roasted Cauliflower and Broccoli, Apple Pancakes from Easy Everyday Gluten-Free Cooking and Breakfast Sausage from Paleo Cooking from Elana’s Pantry, Grilled Cilantro Lime Chicken (inspired by Elana’s Lemon Rosemary Chicken from Paleo Cooking from Elana’s Pantry), Battered Fish from Easy Everyday Gluten-Free Cooking, and Thai Chicken Pizza from Angela’s Kitchen (blush). Sounds delicious, Heather! Amanda at Gluten Free Detroit Metro shared a cookbook that is inspiring her lately, Slow Cooker Recipes: 10 Ingredients or Less And Gluten-Free by Hope Comerford of A Busy Mom’s Slow Cooker Adventures. This cookbook and author sound wonderful and I can’t wait to explore them further. Thanks for the tip, Amanda! 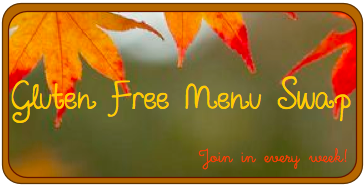 This week’s menu includes Fragrant Lemon Rosemary Chicken, Meatloaf and Baked Sweet Potatoes, Super Easy Pulled Pork, Super Healthy Cabbage Soup, and Chicken Salad Sandwiches & Creamy Tomato Basil Soup. Kimberlee from the Peaceful Mom is cooking up Crunchy Chicken Salad with Easy Baked Apples, Crustless Quiche with Tropical Fruit Salad Baked Potatoes with bacon, Sloppy Joes (on gluten free bread), Cheese Burgers with Home Fried Potatoes, Gluten Free Rotini with Crock Pot Pasta Sauce (made with ground beef instead of sausage), and Chebe Bread Pizza with a romaine salad. Yummy! The Girl Who Couldn’t Eat Anything proves again that multiple food intolerances don’t have to stop you from good eatin’! This week she is serving up Spicy Butternut Squash Nuggets (from Peas and Thank You) or Roasted Butternut Squash Soup, Veggie Enchiladas, Grilled Cheese, and Mushroom Cheddar Toast Frittata (subbing vegan cheese for the cheddar). She just finished reading The Kitchen Counter Cooking School by Kathleen Flinn that sounds like good book about cooking using a template. Sounds interesting and I can’t wait to check it out. Fawn at Dietz Eatz is having a recovery week for their son, so planned leftover meals (brilliant!) and comforting, hearty meals to get them through the week. This week she is serving Salmon with broccoli and rice, Meatloaf, Chicken salad with fried chicken, and Polenta and meatballs. Thanks for hosting this week. My menu is posted at http://celiacfamily.com/?p=8579.